Lower Marble Creek runs from the 9 mile bridge on road 321, to the confluence with the St. Joe. The most commonly run section is from the undeveloped campsite at mile 5, to the Boulder Creek bridge, 1.2 miles above the confluence. This is the steepest section of the creek, with almost non-stop class III-IV whitewater. From the Boulder Bridge down to the confluence is a very scenic class II-III swiftwater float. From the 9 mile bridge down to the mile 5 put in, there are a few fun rapids, but with long sections of class II swiftwater in between. If you need a warm up before jumping on the steep section, start at 9 mile. Three Mile is a solid, technical class IV with a long, busy run out. Wood is prone to collect in the top part of the drop, and in the right hand channel of the runout section. From Three Mile to Boulder Creek is the steepest section of the run, dropping around 140 feet per mile. Its is essentially just one very long, read and run rapid down to Swimming Hole (class IV), the next named drop. Swimming hole is a two-part rapid, split by a sharp left-hand bend with an island in the middle. The lower part contains the large, near river-wide hole the drop is named for. There is a long, fun section of boogy water from Swimming Hole to the Boulder Bridge. Upper Marble Creek, above Nine Mile bridge, is a notch down in difficulty from the lower, but it does contain two long sections of class III+ whitewater. The first is a short distance below the put in, where the river gorges up. The second is just above the take out at 9 mile bridge. Both require boat scouting. Note that there is a mandatory portage around the ruins of an old splash dam located roughly halfway down the upper. Its at the end of a long pool of slack water. Portage using the trail on river right. A rope can be handy to lower boats back down the steep bank to river level. Stay off the ruins of the old dam. They are extremely rickety and dangerous. I almost fell 20 feet into the dam structure when I was monkeying around taking photos. I would have been dead for sure. While not as exciting as lower Marble Creek, the upper is extremely scenic and roadless. Its well worth the trip. Logs are always a very serious hazard on the entire run, and can shift around frequently. Most of the run below nine mile bridge can be road scouted, but wood seems to collect in the hard to see spots, like tight corners and channels. Take your time and get out of your vehicle to scout very carefully on shuttle. 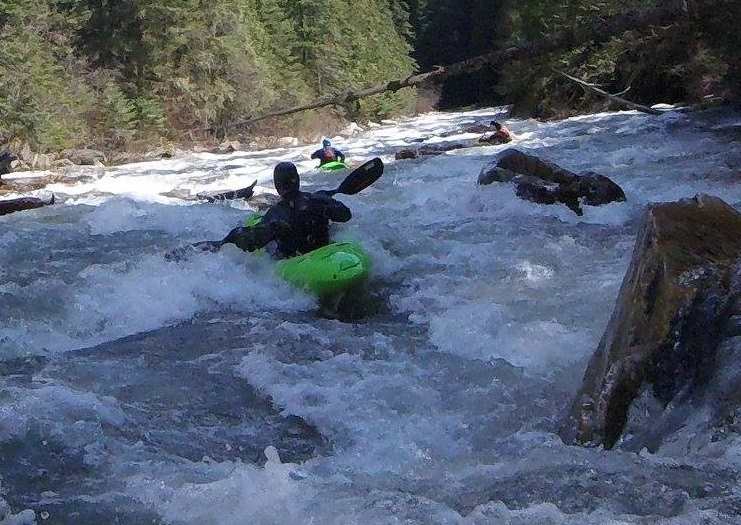 Boaters should have solid class IV skills for Marble Creek, particularly at higher flows. Keep your group tight, paddlers have died here. If you're coming from the East, best access is from Wallace, Idaho. Exit I-90 at the second exit, and work your way south through town, following Placer Creek to Forest Service road 456. Take 456 over Moon Pass (elevation 4,931') and down the North Fork of the St. Joe to the town of Avery (30 miles on dirt road). From Avery, go roughly 15 miles down river (paved road) to the take out at Marble Creek Interpretive Center, at the confluence with the St. Joe. If you're coming from the West or South, best access is via St. Maries, Idaho. It's about 47 miles (paved highway) from St. Maries to the mouth of Marble Creek. For those coming up Highway 3 from the Moscow area, it is possible to take a "short cut" from the town of Clarkia. Take road 321 from Clarkia over Hobo Pass and down Marble Creek. Note that Hobo Pass generally opens late in the Marble Creek season. Check that it is open before you attempt it. The Marble Creek side of the Hobo Pass road is much better than the Clarkia side. To get to the put in, head south up Marble Creek nine miles on road 321. There is a small undeveloped campsite near the Nine Mile bridge with good river access. Another popular put in / take out option for lower Marble Creek runs is to put in near mile 5 where the river is split by a small island, taking out at the Boulder Creek bridge, which is 1.2 miles above the take out. This option cuts out all flatwater. To run upper Marble Creek, above Nine Mile bridge, continue up road 321 for around 4 miles to the next bridge. Note that the road will climb up away from the river. There is a small parking area just below the bridge by the ruins of an old, defunct USGS stream gauge. There are several nice undeveloped camp sites spread out along the shuttle route. There is a hand painted gage on the bridge piling at the confluence of Marble Creek and the St. Joe. Unfortunately, its hard to determine an accurate level using it. In 2011 the stream channel under the bridge was scoured out by high flows, drasticallly changing gage readings. Look for around 4,000 CFS on the USGS St. Joe at Calder gauge for Marble Creek to be in. At minimum flow the run can be a bit scrappy, but is still busy and fun. At flows high flows it is continuous whitewater with big holes and few eddies. The season can starts in April and is usually over by the middle of June.